UPDATE: We are pleased to report that Stonyfield Organic’s Gary Hirshberg contacted us and made a personal contribution and committed to supporting the Yes on 37 California ballot initiative. We are happy to remove him from the updated Missing in Action poster. For more details, click here. Sacramento, CA – Major players in the organic food market have been conspicuously silent in what has become the food fight of the decade. This November, voters in California will have the opportunity to approve a ballot initiative (Proposition 37) that would require the labeling of all food products containing genetically engineered (GE) ingredients, commonly called GMOs. Click here to find a full-sized version. 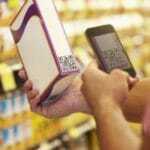 Major agribusiness and biotechnology corporations, like Monsanto, and food manufacturers, like Pepsico and General Mills, are spending tens of millions of dollars in their effort to deny the consumer’s right-to-know what they are eating. But many organic industry observers are most puzzled by the failure of some of the giants of the organic industry to throw their support behind the initiative, which reflects the values held by their most dedicated customers. The Hain Celestial Group has annual sales exceeding $1 billion from more than a dozen brands that are popular with organic consumers, including Earth’s Best, Arrowhead Mills, Garden of Eatin’ and Soy Dream. Information reported by the California Secretary of State has helped illuminate the corporate players fighting the Proposition 37 ballot initiative. Monsanto and the giant food lobby group Grocery Manufacturers of America (GMA) have been joined in the effort to defeat the initiative by multi-billion-dollar, multi-national companies including General Mills, Dean Foods, Kellogg and Pepsico. 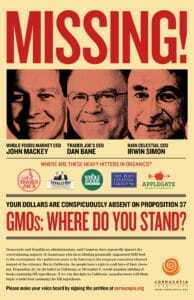 Monsanto alone has donated $4.2 million, while food giants Pepsico and Coca-Cola have each donated more than $1 million. According to Cornucopia, and California state records, numerous more modest companies, such as Nature’s Path, Dr. Bronner’s, Nutiva, Eden Foods, Organic Valley and Lundberg Family Farm are “walking their talk,” having collectively contributed hundreds of thousands of dollars to the campaign in favor of Proposition 37 and food transparency. 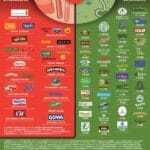 But the California Secretary of State’s records fail to show one red cent from the missing organic industry giants. “There’s been speculation that because some of these company’s leaders have close relationships with Secretary of Agriculture Tom Vilsack, a proponent of genetically engineered foods, and others in the Obama administration, that they are sitting on their hands, and sitting on their wallets, so as not to embarrass the president during an election year,” Kastel notes. Independently owned Debra’s Natural Gourmet competes directly with Whole Foods and Trader Joe’s in the Boston metropolitan market. Mandatory labeling of GE food ingredients is required in the European Union and dozens of other countries across the globe. Where in place, it has led to broad consumer avoidance of foods made with inputs from the biotechnology industry. The most recent polling from California indicated that almost 70% of the population supports labeling of GE ingredients. This level of support will soon be tested by an impending flood of advertisements, financed by Monsanto and the giant food lobby, in opposition to Proposition 37. With stock prices for at least two of the missing organic giants, Whole Foods Markets and the natural and organic foods conglomerate Hain Celestial, at all-time highs, John Roulac, founder and CEO of Nutiva, an organic superfoods company, doubts that their absence is about a lack of resources. Other prominent investors in the Yes 37 Campaign include the well-known natural health website, drmercola.com, and The Organic Consumers Association, with donations of $1.1 million and $770,000, respectively. 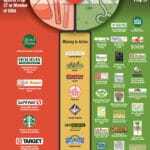 The Cornucopia Institute has developed a chart and graphic https://www.cornucopia.org/2012/08/prop37/ that has gone viral on the web, illustrating the surprising involvement in fighting the right-to-know campaign of the corporate owners of many popular organic brands. General Mills, Kellogg and Dean Foods own iconic organic brands, like Cascadian Farm, Kashi and Horizon Organic, in addition to their much larger stable of conventional food brands.